FIIs were net buyers of equity on all five trading days. Their total net buying was worth a huge Rs 76.4 Billion. DIIs were net buyers of equity on Wed. and Fri. (Feb 27 and Mar 1), but net sellers on the other three trading days. Their total net selling was worth an equally huge Rs 75.2 Billion, as per provisional figures. On Thu. Feb 28 (F&O expiry day), net selling by DIIs exceeded Rs 52 Billion, which turned them into net sellers (Rs 5.7 Billion) for the month. FII net buying during Feb ’19 exceeded Rs 135 Billion, which was their highest net buying in a month since Mar ’17. Despite heavy FII buying, Sensex (-1%) and Nifty (-0.3%) closed lower for the month. Auto sales figures in Feb ’19 were a mixed bag. Maruti (2%), Tata Motors (-2%), Toyota (-1%), Ashok Leyland (1%) sales were almost flat. Honda, M&M, Bajaj Auto, Suzuki Motorcycles showed double digit sales growth. An eventful week started with an air attack on a JeM camp in Pakistan early on Tue. Feb 26, followed by the shooting down of an Indian MiG21 and arrest of its pilot the next day, and ended with the tension and drama of his return after two days. The daily bar chart pattern of Sensex appeared to take it all in its stride. Heavy buying by FIIs and equally heavy selling by DIIs ensured that the trading week ended in a draw. The index gained just 0.5% on a weekly closing basis, as it oscillated about its merged 20 day and 50 day EMAs and faced resistance from the Fibonacci resistance zone. Sensex closed above its three EMAs in bull territory, but needs to move convincingly above the Fibonacci resistance zone if bulls are to regain control of the chart. Bears are doing their level best to ensure that doesn’t happen any time soon. Eight straight days of correction has been followed by eight days of an unconvincing rally. Sensex is back where it was three months ago. The gently rising 200 day EMA is an indication that bulls have a slight advantage. 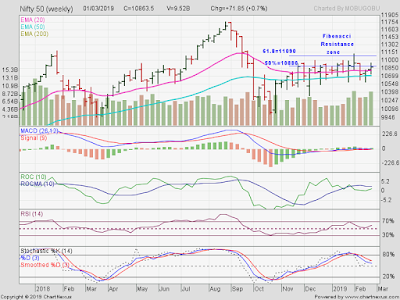 Note that the index touched a lower bottom of 35287 in Feb ’19. If Sensex falls below 35287, it will form a bearish pattern of ‘lower tops lower bottoms’ that can lead to a deeper correction. Likely lower weightage for India in the MSCI Emerging Markets index can trigger the correction. Daily technical indicators are looking neutral to bullish. MACD is entangled with its signal line, and is moving sideways in neutral zone. ROC has crossed above its 10 day MA to enter bullish zone. RSI is moving up towards its 50% level. Slow stochastic has moved up to its 50% level. Mid-cap and small-cap stocks showed some signs of life last week. Some of them have corrected a lot despite decent fundamentals. However, BSE Midcap and BSE Smallcap indices are trading well below their falling 200 day EMAs in bear markets, and it may be too early to call a bottom in either index. Bank FD rates have not fallen much after RBI’s interest rate cut last month. Another rate cut is likely in Apr ’19 as the inflation rate remains low. This may be a good time to lock some money in FDs instead of bargain hunting in stocks. If the index falls from here, cheap stocks can get cheaper. The index closed above its 20 week and 50 week EMAs in bull territory and gained about 0.7% on a weekly closing basis, but faced strong resistance from the Fibonacci resistance zone and closed below it. The gradually rising 50 week EMA shows that bulls have a slight advantage. Weekly technical indicators are looking neutral to bullish. MACD is moving sideways in neutral zone. ROC is in neutral zone, and is trying to move up to its 10 day MA. 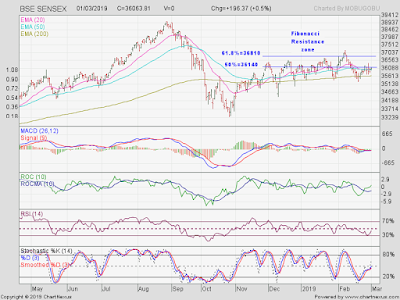 RSI has bounced up from its 50% level. Slow stochastic is falling towards its 50% level. Nifty’s TTM P/E has moved up to 26.49, which is well above its long-term average in overbought zone. The breadth indicator NSE TRIN (not shown) has fallen well inside its overbought zone, and can trigger a corrective move. Bottomline? For the past 4 months, Sensex and Nifty charts have been stuck in a sideways range after sharp corrections during Sep-Oct ’18. Both indices managed to close above their long-term moving averages in bull territories, but failed to cross above Fibonacci resistance zones. The consolidations are likely to continue till the general elections.